Corinthia Hotels 50% Off Annual Sale Is Here! Want to jet off to Morocco, but not sure where to begin? Firstly, find a great bargain holiday to Morocco online, with a company like Bookable Holidays, then then have a look at where you’d like to visit. Morocco is country of contrasts, from the snow-capped Atlas Mountains to the busting souks of Marrakech. It has it all. Home to a UNESCO World Heritage listed medina, this Atlantic harbour town has a bohemian feel (Led Zepplin lived here, as did many other hippie icons). It is popular with tourists who want to see a different side of Morocco from the larger, more busy, cities like Marrakech. Explore Bab El Marse port as well as maze-like streets full of treasures and quirky cafes. Don’t miss the fish market for as-fresh-as-you-can-get produce, as well as plenty of restaurants where you can dine on traditional tagines. The long, golden beach is ideal for surfing and afternoon walks. The fourth-largest city in the country, and undoubtedly the most popular with tourists, Marrakech is the beating heart of Morocco. A treat for the senses, the city is a hub of activity – a snaking maze of streets, colourful souks and pungent street food. One of the most popular spots is Djemaa el-Fna, Marrakech’s main square, which is packed with stalls offering snacks and spices, handmade crafts and gifts. Another perusing the stalls, enjoy a tangy mint tea in one of the many restaurants surrounding the square, offering great views of all the activity. Made famous by the 1942 film Casablanca, this city is vibrant and full of life. One of the main sites is the Hassan II mosque, one of the biggest in the world at 200 metres high. The Aïn-Diab coast is also worth a visit, especially at sunset when you can enjoy a sundowner on one of the many terrace cafes and restaurants. Any outdoors-enthusiast should head to the Atlas Mountains, one of the most stunning parts of Morocco in terms of landscape. Its Berber villages, snow-capped mountains and verdant valleys are perfect for walking and hiking. A good base is Ouirgane – a Berber village situated in the High Atlas Mountains, south west of Marrakech – a popular destination and gateway to the Tassa Ouirgane National Park. It has become a very popular base for longer treks to Jbel Toubkal and Amizmiz areas. For those that like sun, sand and sea, Agadir is the most popular seaside resort of Morocco. With more than 300 days of sunshine a year and a 10km beach of golden sand, it’s not hard to see why. After having your fill of sunbathing and surfing, the old kasbah is well worth a visit. It boasts a fantastic view of the bay and port. The new medina, reconstructed from the 1990s onwards by Italian architect Coco Polizzi, is also a big attraction. Regardless of how long you plan to travel in Europe, the best way to travel is by train. It is the quickest and most cost effective way to get around on the continent. With great tickets such as the eurail pass on offer, there has never been a better excuse to book your ticket, hop on board a train and visit some of the most fantastic cities in the world. Once you have decided which cities you would like to visit and what you would like to see it’s time to start thinking about all of that travelling you will have to do. Here are some great tips that will help you to prepare for the trip ahead. You don’t really need to bring too much with you when you travel, do you? Realistically you can survive with a couple of pairs of trousers, four tops and some underwear. It is a lot easier to travel when you are not weighed down by a heavy bag. Trust me, you will be so thankful that your bag doesn’t weigh a lot when you have to run for a train! You cannot guarantee that the train you are travelling on will have power points for you to charge your electronics. So if you want to listen to music, watch a movie or take photos, make sure that everything has enough battery life to last on your journey. If you are traveling in one of the TGV trains you will more than likely have power because they are some of the most modern trains out there. We all know that when we travel we don’t know if there will be somewhere for us to buy food. So, just incase you get caught short for food on the train always have some emergency snacks with you. It can be a chocolate bar or a bag of crisps, anything to keep the hunger at bay until you reach your destination. You will able to check out the facilities before you leave, but I advise always having something to hand just incase! Greece is known by everyone as being the place where you can go discover ancient civilisation. If you’re not a history buff then there’s no need to worry because there are plenty of other things that will tickle your fancy; quaint villages, sweeping sandy beaches, amazing food and a great friendly atmosphere. It’s only a short flight from the UK so you should take your holiday as soon as possible and fly out to Greece. Without doubt the place has the best food that I have ever tried, the Mediterranean food is so tasty that you won’t want to go back home and when you do you will find the food nowhere near as good! One thing I should mention is that for the health conscious amongst you please forget any idea of diet that you have, you have to eat as much as possible when you are n Greece. There is no way that you can fly all the way there and indulge in every bit of Greek cuisine that you lay your eyes on, if you though Greek food was good back home then wait until you try the real thing! So now you’re going to be eating lots it’s time to tell you about the best places to visit where you can stroll around and burn off those tasty meals. Here are my favourite places to visit on holidays to Greece. This is an easy choice for me, it is one of the most popular places in the country. it is so popular because it is not only steeped in history but it also has some amazing beaches as well. What could be better than exploring historical sites in the morning when the temperature is cool and then lounging on the beach for the rest of the day? This is a must see place. This place is great if you enjoy heading out for a party at night. It’s such a friendly city and is one of the best islands that Greece has to offer. The city is beautiful, it is filled with white washed buildings and sits on the Aegean Sea. This modern city city is fantastic for anyone that is looking for relaxation mixed with a great night life. If heights are not your thing then it’s probably best to mentally prepare yourself before heading here. The breath taking cliffs are stunning, and on top of them you will find a number of monasteries. I personally don’t like heights, but I am so glad I battle my fear and visited Meteora. If you want to take some of the best photos you will will ever take then you have to head to Meteora. Chinese New Year: The best festival in the world! Chinese New Year is without question the best New Year festival in the world, forget the night of December 31 because this fifteen day festival is much more fun, colourful and interesting. We all know that our traditional new year celebrations can be a let down, we build it up so much and then it always seems to not live up to our expectations! Well, with Chinese New Year you have more than one night to have fun so you are guaranteed to have a lot of fun on at least one day I am sure. It’s great that we can now see Chinese New Year being celebrated throughout the world, this is because more people are now able to experience this fantastic festival. Enjoying the food and learning about a new culture is always good, it allows us to get an insight into another country without having to fly all of the way there. If you haven’t been lucky enough to see Chinese New Year for yourself then click here to watch a great video, the visual you get will make you want to find next year’s celebrations. I am sure that you will be able to find one near you because the festival is growing throughout the globe each year. The Chinese New Year celebrations are all focused on welcoming in the new Lunar year and making sure that you have as much luck as possible. A lot of things are related to health, wealth and family. When it comes to money and finances the Chinese believe that you should not go into the new year with any debts, so it is tradition to pay off any money that you owe to friends or family – this is perfect the cousin you only see once a year owes you some cash! Usually the festival is the only time that a family will be together during the year. The majority of families will not all live together in the same city or town, so the festival gives families the opportunity to site together and have a reunion over a fabulous feast of food. You will see some tasty food on offer, if you have any Chinese friends then make sure you try and get an invite to the party so you can eat as much amazing food as possible! This year is the year of the horse, to find out which animal represents the year you were born then enter your date of birth of below, you will also find out some other great insights into you and your future. So hands up, who has the tune to the lyrics ‘climb every mountain, search high and low’ running through their head right now? There are not many of us who have not been to a sing a long of The Sound of Music or who do not know someone who has. It is part and parcel of our culture and astoundingly the reason for 70% of visitors to Salzburg choosing to travel there. Our love affair with the Sound of Music has left many Austrians raising their eyebrows and shaking their heads in a bemused fashion. Indeed you will find that outside of Strazburg not many Austrians have even watched the Sound of Music and do not realise the impact that the film had. It has not however taken long for people in Strazburg itself to understand the affection we have for it and to provide us with a new more intimate way of gorging ourselves on the music and story we are so fond of. Now when you get to Salzburg you have options like the Sound of Music Tours where you will be likely to visit delights like the Mirabell Palace, where you will remember the children of the Von Trapp Family using the steps like a musical scale to sing the song Do-Re-Me and the famous Leopoldskron Palace which was used as the Von Trapp home. If you visit at the right time of year you may also be lucky enough to come across one of the many Sound of Music dinner shows which are run in the city. As if that was not enough you can also book a hotel which will show your favourite film round the clock so you can come in from your show and watch it all again. If all of that has left you wanting more, Salzburg is located in such beautiful mountainous countryside that it would be a shame if you did not have a day trip out to enjoy it. Picture yourself now running up the hillside arms outstretched just like Maria. There are many tours and trips that you can take that will add to your Sound of Music experience. As with any break that you want to get the most from, research is key so decide what it is that you are looking for and book it ahead. I doubt that when the film was made the people responsible would realise the impact and the enjoyment that it would give to countless numbers who have now descended on the picturesque city. It is now one of our favourite things. China is an extraordinary place, and I think a major part of its appeal among tourists is the fact that there are just so many experiences you can have here. If it’s traditional China you’re keen to discover, the city of Kunming should definitely be high on your to-do list. 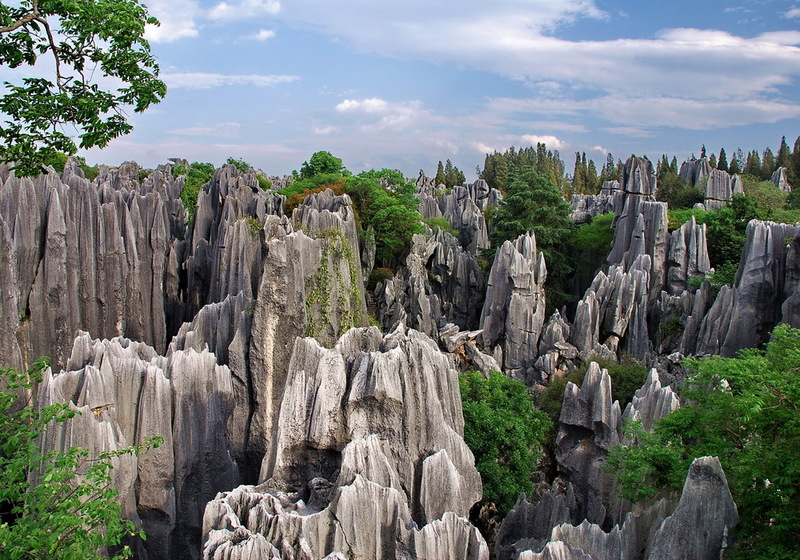 Kunming is the capital of the Yunnan province, which is in south-west China. One of the things I like most about it is that, despite having all the features you’d expect of a modern city (skyscrapers, massive shopping centres and such), it’s also got heaps of more traditional attractions. So, in my opinion there are few places to get a better experience of China’s past and present. Another thing I like about it is that it somehow feels quite a bit more laid-back than many Chinese cities – something to do with the mild climate, perhaps, or its beautiful green parks. Of course, no doubt what you’re most interested in is finding out what you can see and do while you’re here. Below, I’ve highlighted three of my favourite attractions, each of which I think has something quite different (and special) to offer. It’s worth bearing these in mind when organising your holiday to China to make sure you get an itinerary that works for you. Dating back to the Tang Dynasty, the Bamboo Temple was rebuilt in the 15th century following a fire. It is later restoration work, carried out in the 19th century, that has really helped to put this place on the map though. You see, back in the 1800s, Chinese sculptor Li Guangxiu helped out with the temple’s restoration, and when he did he created 500 amazing life-size – and incredibly lifelike – figures, including a series of surfing Buddhas riding on things like unicorns and crabs. It’s rumoured he modelled these creations on people he knew, almost like a caricature – and that these people were none too happy about it! I should probably warn you that tourists aren’t actually allowed into the room with the statues these days – but you can still catch a glimpse of them as you meander around. Green Lake Park is one of the best places to go if you want to relax a little. As well as being a lovely place for walks, it’s also a great place for nature-spotting – especially if you’re planning to travel in November, since this is when the red-beaked seagulls are around. If birdwatching isn’t your thing, though, people-watching is a popular pastime here too. Alternatively, the roads along the park have a lot to offer too if you fancy something a little more lively, with plenty of shops and cafes located here. My final suggestion is Yunnan Provincial Museum, which is a great place to learn more about local early cultures. There are around 50,000 artefacts to peruse, including 7,000 bronze items and 4,000 handicrafts. While all these are very impressive, I think the highlight for most people is the fossilised humanoid teeth, which are around 1.7 million years old! Reasons why living in London is great! Year after year people from all over the world choose to move to London. The capital city of England certainly has a great draw that attracts so many people, there are a number of benefits to living in London. Of course not everyone will enjoy living in London, city life is not always for everyone, but here is our list of why so many people choose to head there every year. Regardless of what salary you are looking for then London will have it, there are jobs of all types in all industries in the capital city. Like most capital cities it is the hub for all business, tourism and arts. So if you’re looking to be a star in the West End theatre seen you will always be able to find a job in the catering industry to keep you going. London is the center of finance so there are always lots of high end jobs for people to take up. When you are in London you are in the main European transport hub. There are various airports for you to fly from, fantastic train stations and also great bus services. Wherever you want to go whether it is in the United Kingdom, Europe or anywhere else in the world you will be able to get there from London. When you live in London you are never short of things to fill your time. There are lots of clubs and sports to join if you want to get fit and meet new people. If you love music then London is the place to be, there is everything from fantastic Jazz to rock and roll. Then there is the West End where you will be able to enjoy some of the best theatre that the world has to offer, there are a number of long running shows there. There are also a number of different things to do that are sometimes different to anything else you have done, a great example are some of the super fun treasure hunts you can go on you should check out Wildgoose if you want to have a great day out! There are few places that can match Bavaria for architectural beauty, with the castles, churches and other iconic buildings appearing like something out of a fairytale. The famous Cinderella Castle of Walt Disney’s Magic Kingdom was even based on one of Bavaria’s 19th-century palaces, and if you want to discover the charm of this amazing region for yourself then you can’t go wrong with a trip to Munich. Some of the area’s best towers and castles – including the dreamlike Neuschwanstein Castle – can be found sprinkled around the countryside and in small villages, so if you want to see them all then you may want to hire a car at Munich airport. However, there are also plenty of amazing structures to see within Munich itself, and in this guide we’ll introduce you to a few of them. The two domes of the Frauenkirche have become something of a symbol of Munich since this church was built in the late 15th century. Located in the Old City, or Altstadt Lehel, its twin towers stand at a height of 99 m and offer amazing views of the city and the surrounding countryside – stretching all the way to the Alps – from the top. Officially called Dom zu Unserer Lieben Frau, meaning Cathedral of Our Dear lady, the building is a perfect example of the Gothic style for which Munich is so famous, and is home to the legendary devil’s footprint, which is impressed into the floor of the church. Also in the Altstadt Lehel is the Church of St Peter, which sits on the Petersbergl hill and provides a view that can rival that of the Frauenkirche. You’ll have to ascend 299 steps to enjoy it though, but the reward more than makes up for the effort. Originally constructed in the 11th century, the church has been expanded, redeveloped and redecorated numerous times throughout history, and is home to a number of wonderful pieces of art from various periods of Munich’s past. Large ceiling frescoes cover the church’s nave, while each side of the tower also features two clock faces. Inspired by Rome’s Sant’Andrea Della Valle, the Theatinerkirche sits in Odeonsplatz and was designed by Italian architect Agostino Barelli in the high Baroque style, with construction taking place between 1663 and 1690. Further features were later added by a succession of other architects, including Enrico Zuccalli who added two towers, as well as Francois de Cuvillies, who completed the Rococo-style facade in 1768. Perhaps the most fascinating thing about this particular building is the fact that it was built by a pair of brothers as their own private church. However, shortly after its completion in 1746, owners Egid Quirin Asam and Cosmas Damian Asam were forced to open their place of worship to the public under pressure from Munich’s staunchly religious citizens. Located on Senlingerstraße, near Sendlinger Tor (one of the three remaining city gates), the Asamkirche is a great example of late Baroque architecture and is typical of the sorts of buildings that can be found throughout Bavaria.